The Belgian Grand Prix kicked off with a chaotic first lap that saw Max Verstappen drop back to battle with the two Ferrari drivers into the first corner. 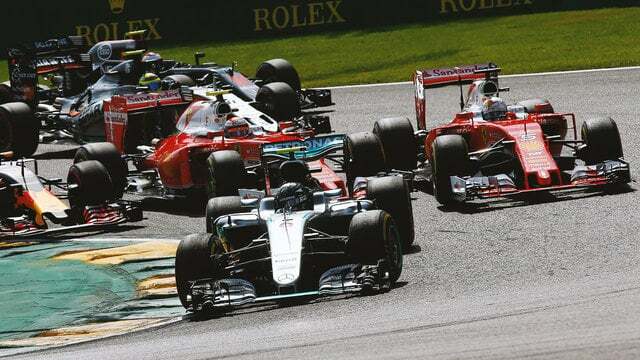 The three were squeezed together, with contact which saw Sebastian Vettel spin around, and Kimi Räikkönen pick up some damage. Kimi’s car later caught fire in the pit lane, but the Finn continued racing, had yet more incidents in combat with Verstappen, and he got to the end of the race in the top ten. Meanwhile, Kevin Magnussen had a huge crash at the top of Eau Rouge, smashing into the barriers. He limped from the car and was taken to hospital for checks but is okay apart from a sore ankle. The race was red flagged for repairs to the barriers, which helped both Lewis Hamilton and Fernando Alonso in their quest to recover from starting at the back of the grid. Hamilton was up in fifth when the red flag came out, and by the end of the race he had made his way to third, to finish on the podium behind race winner Nico Rosberg and second place Daniel Ricciardo. Other retirements included Wehrlein, Button, Sainz and Ericsson.